Builder Huts are the key to this game. Imagine having only one builder!! The game would be painstakingly boring since you would have an overflow of resources due to long update times. Granted, even 5 isn’t enough for some people. I have some ideas which would greatly improve builders in general. I don’t know about you, but I always have all my builders working; there are just so many things to upgrade! A sixth builder would make it much harder to constantly have them running. Unfortunately, that would mean less storage raids would be available since more resources would be getting put into upgrading. I usually have full storages around the clock just waiting for a builder to open up. This sixth builder would allow for me to not be idle in raiding and playing in general. This would go along with having more builders. Upgrading a hut would either give you an extra builder or it would allow you to build in half the time. Furthermore, if you upgraded it to level 3 it would only take 1/4 of the originally time. All of the TH10 upgrades and some TH9 upgrades take insanely long, up to 14 days. 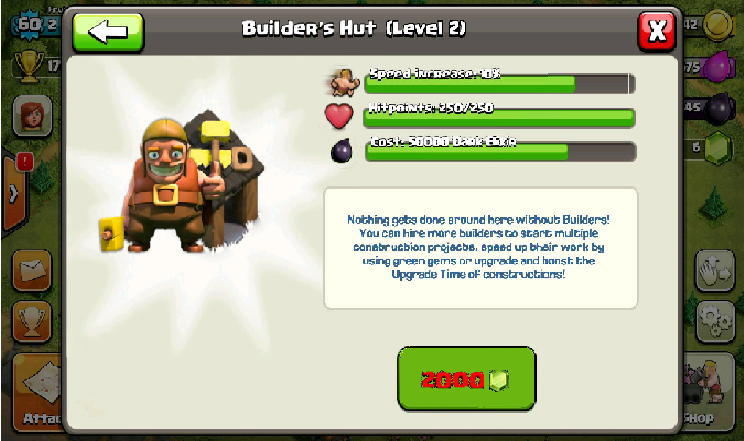 This makes clashers take a break since it takes FOREVER for something to upgrade at the higher levels. Upgrading would allow for quicker build times in a sense. When you boost a barrack, the troop production speeds up. It could work the same way with the builders. Boost for a day and during that time, they would build everything at double the rate. Obviously, this would not cost one gem, but a lot, maybe up to 50. To me, this is the option I feel Supercell would most add, since they can make money (everyone would be boosting their builders, therefore they need to buy more gems) plus it wouldn’t create overpowered builders. Thanks for reading guys! Remember, these are not to be added. These are just my personal ideas about how the long build time situation could be fixed.